I’m not a fan of summer. I am so much more of an autumn/winter kind of gal. I can’t cope with the heat, it makes my asthma so bad that I’m basically just stuck laid in bed with the fan on full blast just so I can breathe! Not only that but if I do manage to venture outside, I burn to a crisp the second the sun touches my skin. One thing I do love doing in the summer (okay any season really) is curling up and reading a good book. In winter its all about curling up in my fluffy pjs with a hot chocolate and my body weight in snacks! In summer I tend to sit on my windowsill with the window open and have a huge glass of iced ribena. Oh and a fruit salad, can’t forget one of those! I’m a self confessed bookworm and have probably read more books that I’ve had hot dinners. I’ve ever started getting into audiobooks lately, Stephen Fry reading Harry Potter has become my new favourite thing to listen to while writing blog posts! 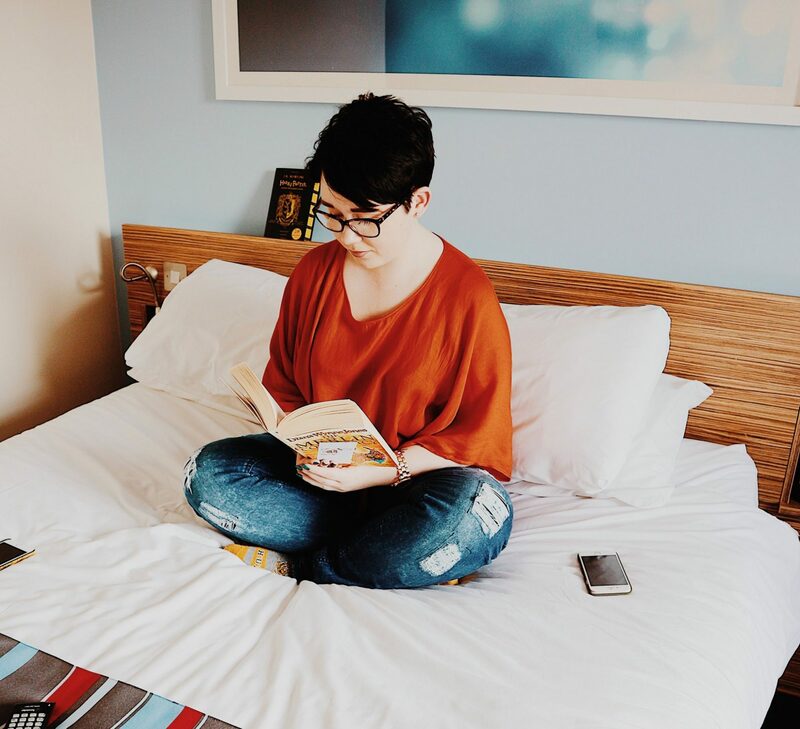 I love finding new books to read (even if my bank account doesn’t) so I decided to write a booklist to hopefully help you find a new book or two to sink your teeth into this summer! I was originally given the second book in this series as a gift from my favourite primary school teacher as a leaving gift. I’m not sure why she picked the second book, but luckily my parents managed to find me the first and last book on a car boot sale only a few weeks later! I read all three within the week and even nearly 15 years later I still love to read them- even if I do cry at the ending! Plus he’s bringing out two more books (one set before and the other after the original books) and I can’t wait to get hold of them! My auntie let me borrow the first of these books when I was a teenager and I’ve been hooked ever since. The final one has only just come out and I’m so sad the series has ended! I hope that she changes her mind and ends up at least writing a few short stories or a novella. It deals with so many relatable issues and actually helped me develop some of the coping techniques I use to manage my mental health. This is another series that has helped me deal with some of my own personal demons. There are lots of different main female characters throughout all the different books, but my favourite is always going to be Elena the werewolf. All of the women are sworn, fierce and independent and great role models for young women! I first found these books in the school library and ended up accidentally starting on the second book. Luckily the way they are written meant that it didn’t make a difference, I still understood the whole story and reading the first one just filled in a few little bits of back story I hadn’t been able to figure out myself. Two more books have come out since I left school and they’re just as great as the original trilogy! And if you need another reason to read them, theres an adorable talking (and very sarcastic) dog in them! In honour of season 7 starting this month (FINALLY!) I couldn’t fail to mention the books in this post. I read the books before watching the show and I’m so glad I did: the books are so much more detailed and have a lot more depth to them. Yes they are huge (I bought them on kindle to save room!) and the 5th one was a real slog to get through, as all my least favourite characters are in it, but its worth it for all the extra story. You’ll end up with a different story to the tv show too as they’ve changed loads of things in the later seasons. The only problem with reading the books is that GRRM still hasn’t written the next book and I’m getting very sick of waiting now: he left it on a right cliffhanger and I need to know what happens! I could go on listing my favourites all day but I think thats enough for now. I might actually create a part two to this next month if this one is popular. What are some of your favourite books to read? "Thoughts People With Anxiety Have While Driving"
"All About Self Love Tag"
Oh man, I love Stephen Fry reading Harry Potter. Confession: as big a bookworm as I am, I have never read any of the books on your summer TBR! Eek. The Study series is on my TBR though. I’ve only just discovered it but I’m already in love! I really loved the graphics and photos in the post. Which book has ‘Slytherin’ written on it? I would love to know!! Please please tell me. Thank you so much I’m so glad you like both my content and the layout of my blog! 😁 also props to a fellow book lover/Summer hater! I love finding new book series! Thank you for sharing these. And from one summer hater to another, I feel ya. This Texas heat is enough to shrivel up most people and I have had to learn to flip-flop my seasons. As a quilter, winter is MUCH more preferable.